“The nature of the soul is to be detached from all selfish, egoistic material desires. On the path of Bhakti, the perfection of detachment is complete attachment.”- Radhanath Swami. Simple detachment from the selfish urges of the mind and senses can bring shanti, or peace. But the soul is thirsting for something more than these. The soul is thirsting for love, or prema. And that prema manifests, when we become completely attached to Krishna. Attachment to Krishna means attachment to serving Krishna, to pleasing Krishna. That the perfection of all of our dharmas, our occupations, of all religions is to please Krishna. Srimad Bhagavatam tells the story of Durvasa. He was such a powerful mystic yogi. And Ambarisha was a simple householder with a family. Ambarisha was just trying to do good. He had only good intentions. But Durvasa Muni, he interpreted it as an offense. So, he took a hair from his head. He threw it on the ground. The hair became a fiery monster. And that monster went to kill Ambrisha. But Lord Vishnu killed the monster with His Sudarshan. And the Sudarshan chased after Durvasa. Durvasa went to Brahma. He went to Shiva. Ultimately, he went to Vishnu and surrendered to Vishnu – “Please save me!” Such a difference! 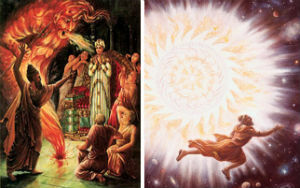 Because when this monster, this fiery demon, was approaching Ambarisha, he didn’t say, “Krishna, save me”. He was just offering his life to Krishna – “You can do whatever you like with me, I am yours”. That’s detachment. Ambarisha is living in a palace. He has a beautiful wife. He has children. He is managing all sorts of government affairs. And when there is a fiery entity coming to kill him, to devour him, roaring at him, he is fearlessly – “Krishna, I am yours. You can kill me. You can protect me. 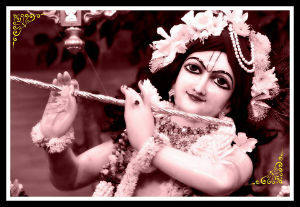 I am yours.” He was totally attached to Krishna. Srimad Bhagavatam tells the story of Durvasa. He was such a powerful mystic yogi. He lives in caves. He lives under trees. He just wears kaupins. He doesn’t have any possessions. He doesn’t have any children. He doesn’t have any family. He never had a job in his life. He is a real sadhu as far as renunciation. And when a fiery entity came toward him, he ran away in total fear. He ran and ran and ran. He was begging so many people for protection. 9 Responses to "Perfection of detachment"
Very good example of How Durvasa Muni, though a great sage was not so detached as King Ambarish. Real detachment is attachment to the Lord. Real detachment is attachment to Krishna. Amazing statement by Radhanath Swami Maharaj. True! Though we may be materially detached, but if we are not attached to Krsna then that detachment is of no use as we could fall anytime. In current era, there are so many so called sadhu. They just wear the dress of sadhu and expose themselves as a sadhu. But in their heart they are full of desires. Desire to enjoy and practically they can’t renounce any thing. In front of people they behavior differently and in their chamber their behavior is completely different. So we must have to be very careful before we select guru. Here Radhanath Swami describes wonderful story from Srimad Bhagvatam about Durvasa muni. Even though Durvasa muni is great saint but he made a mistake by misunderstanding the behavior of a great devotee Ambrish Maharaj. Thus compared to external renunciation, it is better to be attached with Krishna and perform all our household task as a service to Krisha is better. In the Journey Home, Radhanath Swami Maharaj speaks of his encounters with many sadhus. Some were genuine, some fake. The world is like that; there are the good and the bad in every sphere of life. But often times we make the mistake of branding a whole group as good or bad, just by seeing a few samples. We could go terribly wrong there. True! In this age it is difficult for people to judge a genuine sadhu from a fake. As Srila Prabhupad says if we want to be cheated, there are enough people to cheat us. We should genuinely want to search for a true spiritual master from a proper lineage. Fortunately we have many genuine sadhus such as Radhanath Swami.